Through oil and water­color, John Rhett cap­tures the beauty of the ordinary on canvas. The sub­jects of his paintings are often rural Mid­western land­scapes, the kind Amer­icans too often take for granted. On Friday, Jan. 25, Hillsdale stu­dents had the oppor­tunity to attend a reception for Rhett’s ongoing art exhibit and discuss any­thing from artistic tech­nique to the role of painting in society today. Rhett is a con­tem­porary painter and chair of the art department at Houghton College. 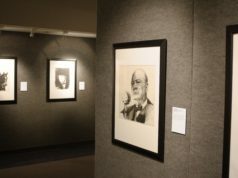 Hillsdale’s art department hosted Rhett to expose stu­dents to the work and reflec­tions of a con­tem­porary artist. 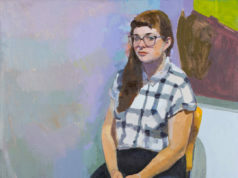 The selection of paintings exhibited, Rhett told stu­dents, were a small fraction of a drawer full of less-suc­cessful attempts to encap­sulate natural beauty: “You do a stack of ‘em, and they’re in the drawer, and you know, they’re ter­rible”. Art major Heidi Yacoubian chimed in, laughing. “That’s like 90 percent of artists’ work,” she said. 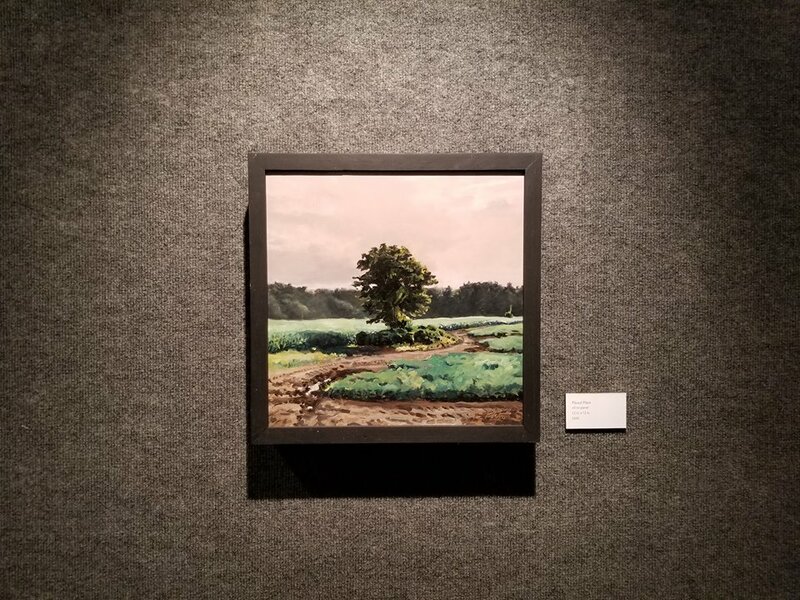 Rhett’s scenes of roads, forests, and open fields, sub­jected to the dif­ferent times of day and seasons of the year, high­light nature’s cyclical beauty. Even for a pro­fes­sional painter, “clumsy han­dling” and “over­working” a piece can cause a simple water­color of a Mid­western road to fail, Rhett told stu­dents. Rhett dis­cussed how the medium of painting fits into modern society. “You ask anybody, they can’t name a con­tem­porary painter, but they can name a famous movie director,” he said. Thus, Rhett observes that the “lan­guage” of painting does not play as essential of a role in intel­lectual and aes­thetic con­ver­sation as it did in the past. Though the medium of painting is less prominent today, Rhett’s work demon­strates how paintings can intrigue an artist’s audience. Many stu­dents dis­cussed how familiar Rhett’s simple out­doors scenes seemed to them, and Rhett’s work is char­ac­terized by the acces­si­bility of his sub­jects. But these com­mon­place scenes often connect the viewer by using nos­talgic mem­ories and familiar lines of poetry. Pro­fessor of art Julio Suarez said that for art stu­dents in par­ticular, exhi­bi­tions like these offer con­tem­porary examples of what stu­dents ought to aim for in their own artwork, so they can develop some of the skills used by vis­iting artists. 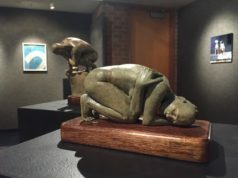 If pos­sible, Bushey and Suarez stated, it’s ideal for the art department to exhibit artwork that demon­strates the tech­niques stu­dents are cur­rently learning. When asked how he con­nects poetry and abstract ideas to his work, Rhett said there is not a spe­cific pattern to his lit­erary allu­sions. Many of Rhett’s paintings feature roads, which he attributed to his fre­quent road travel. “When you’re on the road every­thing becomes sort of ‘fly-by country.’ For us Amer­icans, roads are so ubiq­uitous,” Rhett said. Rhett said he finds nature creates her own beauty and variety that sur­passes, in many cases, human attempts to man­u­facture excitement and intrigue. “Enlight­enment comes during ordinary moments. The day to day things: You come to prefer them,” he said. Pro­fessor of art Barbara Bushey pointed out that Rhett’s roads are no dif­ferent from some of the roads around Hillsdale. “Some­times, espe­cially in Hillsdale, we think, ‘Oh, here we are in the middle of the corn­field,’ but there is beauty there too,” Bushey said.